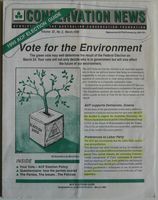 The Australian Conservation Foundation (ACF) released this document prior to the 1990 federal election. It outlines the environmental policies of all the major political parties. Peter Garrett (ACF President of the time) recommends that environmentalists vote for the Australian Democrats.